As a BC-ite and fur trade historian of sorts, I have been brought up on the notion that the salmon runs were regular events, and that only once in every four years were they poor. But reading the fur trade journals, 1848-1858, I am not sure that is true. There were more poor salmon runs than good, which caused huge problems in New Caledonia in those years. Let me see if I can prove my point. I may not understand what I am saying, not being a fish biologist — but I think it is important nevertheless. Both Chinook and Sockeye swam past Fort Alexandria and Fort George and up the Neckako River. The Chinook heading toward Fraser’s Lake turned off into Nautley River and spawned there, while the smaller salmon, the Sockeye, swam through Fraser’s Lake and spawned in Francois Lake to the west. At Fort St. James, the Sockeye swam through the lake and spawned in other lakes to the north, while the Chinook spawned in the river just south of Stuart’s Lake and Fort St. James. Babine Lake is close to Stuart’s Lake, but its river flows west into the Pacific and is not connected to the Fraser River system. They have Sockeye, Coho, Pink Salmon, and Chinook. South of Fort Alexandria, the Chilcotin River provided the spawning ground for the Chinook. My great-grandfather’s writing tells me nothing of the Kamloops salmon, of course, and that research is quite separate. I discovered the Deadman River has Coho and Chinook. The Adams River has Sockeye which spawn in late October, and the Shuswap River has Chinook (though one of my sources also lists Sockeye). Spius Creek, near Merritt, has Chinook and Coho. So Kamloops has a good selection of salmon, though perhaps smaller runs. However, the Kamloops post also traded for fish on the Okanagan River near Skaha Lake, and I presume both fish were available at that place in the 1840’s and 1850’s. Today an experimental fisheries restoration run by the local Natives exists on the Okanagan River, and though the Sockeye were the fish they successfully restored to the river, among the swarm of smaller salmon they found a few Chinook. These fish were DNA tested, and found to be not strays, but descendants of a fish stock that was thought extinct. These Okanagan River fish swim up the Columbia River, and are entirely separate from the Fraser River salmon. So, for the first few years, I take my information from the Fort Alexandria journals of Alexander Caulfield Anderson. He arrived there winter 1842, and so we will see what he has to say in the years that followed. In November they were trading for salmon at the Chilcotin River, and so there was no shortage of salmon in summer, 1842. Salmon were good in 1843, too: At the end of July, he wrote in his journal that “Salmon are pretty abundant & the Natives are day by day adding to their stock, besides supplying us abundantly for daily consumption.” However, it appears the Natives starved a little over the winter of 1843-1844. In 1844, the salmon run failed. Few salmon made their appearance at Fort Alexandria, though Michel Ogden traded for 3,000 fish at the Barrier of the Chilcotin River. In November there were no more salmon traded at the Chilcotin, and Kamloops had none to spare. The Fort Alexandria gardens saved Fort Alexandria but, according to Anderson, the Natives starved. The end result of few salmon dried and stored in 1844 meant that there was not enough dried fish to feed the men in the brigades next summer. In April 1845, two Chilcotin men came from the Barrier: “They complain sadly of starvation,” Anderson wrote. In July the water was high and the Natives pulled their weirs. This part of the journal is lost, but it seems they caught salmon as there is no shortage of fish in the later journal. 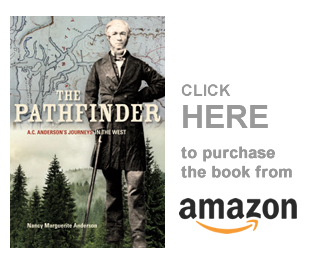 In 1846 the salmon runs were good, and Anderson was at Fort Langley when he reported that the salmon were coming upriver pretty steadily, and that the Chinook were numerous. 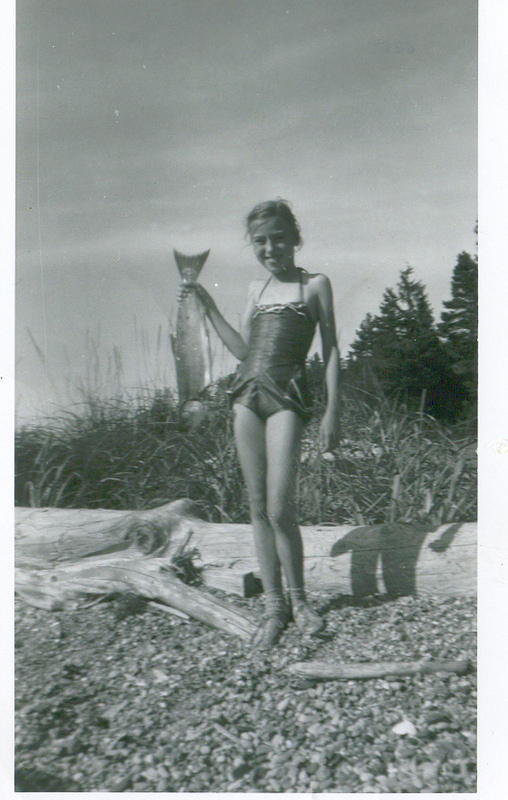 At Fort Alexandria there was no shortage of fishy provisions that year. However, in 1847, John Tod of Kamloops reported on the scarcity of salmon in the Thompson’s River — the result of uncommonly low state of water in all the Rivers in the territory. At Fort Alexandria Anderson reported in September, that “we have not a salmon in store nor have the Indians any to trade us.” The normal rations for the men were two dried salmon and one pint of flour a day, with four gallons of potatoes and a half-keg of turnips a week. By January 1848 they had run out of flour, and Anderson substituted a quart of barley and increased the rations of turnips. The men did not complain, because they knew they were eating better than those at other posts in the territory. If the salmon runs failed every four years, then they should have failed in 1848. However, the HBC men did not seem to worry about a shortage of food for the men, though the horses certainly starved — that is, however, another story. Anderson had left Fort Alexandria by this time, and so I do not have his reports. It does appear that the Fort Alexandria run might not have been large (or efficiently run), as in early 1849 the outgoing brigade delivered salmon to the posts downriver, as is shown below. In 1849, the outgoing brigade was delayed at Chinlac (at the forks of the Neckako and Stuart Rivers), “waiting for the Fraser’s Lake Boat in order to obtain Salmon for Fort George & this post [Fort Alexandria].” These posts were probably short of salmon as well as vegetables and grains. Anderson had left Fort Alexandria, but even before he left the farming was done by the Natives as he had few French or Metis employees left. Still, in the fall of 1849 the salmon run appeared to be good, as Marineau was kept busy trading salmon. In September 1852, James Douglas, of Fort Victoria, reported to the HBC Committee in London that the salmon run that year was late. In fact, by the time the salmon reached Fort St. James, the Natives had already taken up their weirs and caught none of them. I have no information about the 1853 salmon run, and so it must have been close to normal. But in 1854, Douglas wrote to Paul Fraser of Kamloops, that he was “sorry to hear of the scarcity of salmon in Thompson’s River but I have no doubt you will be able to procure a good supply from the Tribes inhabiting the banks of Frazer’s River, and I trust that your Indians may also have their needs provided for through the same means.” [B.226/b/10 fo. 157a, HBCA] In fact, no salmon were taken in the North Thompson River that year, though the Fraser River Natives did report that the salmon were abundant in that river. Was there a good Chinook run, but a poor Sockeye run that year? In early 1856 Donald Manson reported from Fort St. James, that: “Had I not very fortunately received a small supply of 8,000 from the Babine Fishery [in 1855], we should have been very badly off indeed.” [D.5/41, fo. 108, HBCA] The Thompson’s River district post of Kamloops, now in the hands of Donald McLean, provided fish for provisions for the Brigade, something he was apparently able to do. However, not only did Kamloops obtain salmon from the Thompson and North Thompson, but they also traded for that fish at the Okanagan River fisheries south of the post. I have no information on what happened in 1858, as my research ends with the beginning of the gold rush of 1858. Not being at all an expert in the salmon runs or even in the types of salmon that swam up the Fraser River, I don’t know what to think of this constant scarcity of salmon in this river in 1847 and later. These were generally cold winters, but cold would have been good for the fish at sea, I understand. What could be the problem? What changed in New Caledonia after Anderson left Fort Alexandria? Were the Natives more unwilling to trade their salmon to the HBC? That seems likely, but there were also “starving Natives,” as we see in the records. I know that at Fort Alexandria some years, the HBC men allowed the Natives to trade for the fish that were in the Fort Alexandria salmon store: salmon that the Natives had traded to them earlier in the year. Were there actually fewer salmon in the Fraser, or was the salmon shortage a complication of the staffing and provisioning problems that the HBC traders were suffering from over these years? Or were the salmon runs affected by landslides or blockages downriver in some years — or over-fishing at Fort Langley and the San Juan Islands fishing stations? I don’t have the answers to these questions, but others might. However, I must say, that I found it very interesting that in years when there was starvation among the Natives, that fewer marten furs came into the forts. According to Donald Manson, it was a well known fact among the HBC men, that martens provided little food, and so the Natives did not waste their energy trapping that animal when they were short of salmon. A person once told me that animals are the only things that needed their furs. But when the meat of the animal trapped by the Native hunter provided food for his family, and the furs traded at the HBC posts bought knives, ammunition, and tobacco, I think you have to be careful in criticizing a history you know nothing of. They did things differently in the past, and sometimes people have to be open to ideas they might argue against today. Actually salmon runs peak every four years. The next year is usually poor then the runs build every year until peaking at year 4 again. Thanks. Maybe that’s a way to explain what I am finding.